We have just one cat in our family and we keep the litter boxes in our living room. Yes, that’s litter boxes – in plural. When they see our two large litter boxes, guests often wonder if we have more than one cat. When we tell them we only have the one big beautiful red tabby, a common response is: “Really? How many litter boxes do you need for a single cat?” Which is a great question that leads to the more general question of how many litter boxes per cat should you have in a household with cats? We’re here to provide you with some answers. Consider this your top resource for the question. We’re about to delve real deep in and cover all options. By the time you finish reading this guide, you’re going to become an expert on the question too! Yup. There’s a formula for that. Don’t worry, it’s a really easy one. You don’t have to be a maths wiz to use it, promise! The formula is to take the number of cats you have in your household and add one. That would give you the minimum number of litter boxes that you need. So, if you have three cats, then it would be three plus one and four is the number of litter boxes that you need. If you only have one cat, than it’s one plus one and you end up with two litter boxes. Which basically explains why we have two litter boxes in our home, with only one cat. Clearly, if you don’t have cats at all, there’s no need to add one to zero, ha ha. Getting serious again, you may be asking yourself this: How come most cat owners get by just fine with one box per cat. In fact, you may be doing ok with three cats and two boxes. Or even a single box per three cats. And let’s face it, litter boxes aren’t that much fun to handle, so why add unless you absolutely have to? Good questions, all of them. There are good answers to them too. Just keep on reading – all will be revealed in this post! A gorgeous “dream cat house” with ladders, tunnels, slides and secret passages all over the place is bound to provide more space and stimuli to any feline, keeping Kitty mentally and physically healthier. Let us guess though, your home probably doesn’t look exactly like that? And chances are your cat manages just fine with one or two cat trees, or maybe just jumping on the kitchen counters. The point is, cats are flexible, and there’s a range of living conditions we can provide them, on a spectrum that leads from terrible, to ok, to absolutely fine to crazy-cat-lover-fantastic. On that spectrum, one box per cat is more towards the “ok”. Switch to using our formula (number of cats + 1) and you’ll be moving over to “absolutely fine”. Which can really matter at some point in your cat’s life. You see, a cat’s regular use of the litter box is affected – among other things – by the level of stress in Kitty’s life. As long as things are fine and the cat is not very stressed in general, he or she will stick to using the box. When a new source of stress shows up – be it illness, a new cat or a favorite human leaving the household – stress levels rise. When that happens, a cat can become less flexible. That’s when that added litter box can make the difference between a feline that continues to use only a litter box – and one who doesn’t. Even more litter boxes per cat? It would give you the minimal number of litter boxes that you need. More than two boxes for a single cat??? Have we gone mad??? Don’t worry. You probably don’t need more than the minimal number that the formula suggests. Unless one of the following situations applies to you and your kitties. If you’re fortunate enough to live in a small mansion of 3000 square ft and above, you may need to consider adding more litter boxes and spreading them around. Don’t expect a cat to have to run for hundreds of yards whenever she needs to pee. If your home exceeds 3000 square feet, we bet you have at least three bathrooms, right? Your cat deserves nothing less. Regardless of your overall floor space, you would do best to keep one litter box per floor level. That includes the basement, if Kitty is allowed to explore there. Again, you’re trying to save your cat from this dilemma: Should I run down/up a staircase with a full bladder, or maybe just go on the nearby rug? Anything that limits a cat “litter box range” is a problem. Senior cats may take longer to get up and make it all the way to a litter box in the other side of your home, especially is their arthritic. A cat with diabetes or urinary tract infection will need to pee more often and again, would need a nearby litter box. As for kittens, when they’re a few weeks old, they may not be able to reach the box in time too, if it’s too far away. 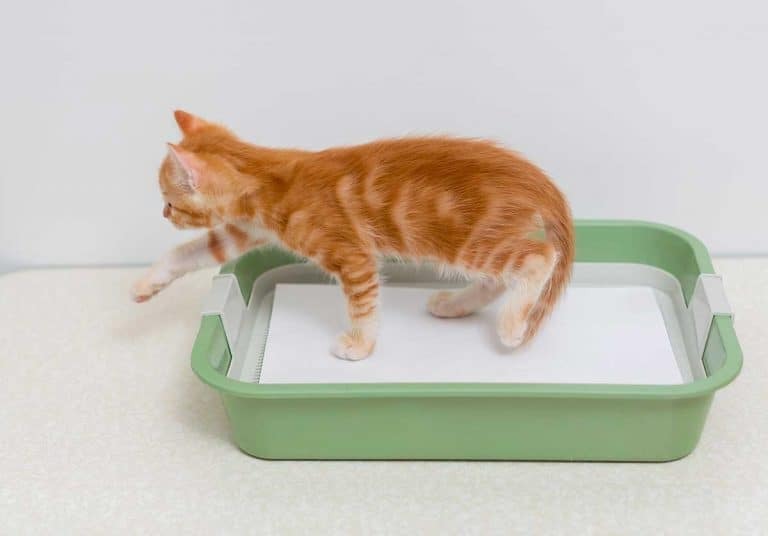 Even with a healthy adult cat, a sudden onset of diarrhea may mean several rushed visits to the litter box – and there better be one that a quick dash will get Kitty to. Yes, we already answered this very question but a. it bears repeating the answer and b. there are a few things to elaborate on here. 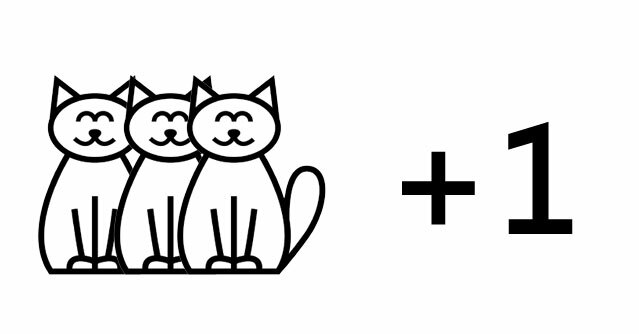 The answer we gave earlier was two (one cat + one, as per the formula). By “more options to choose from” we mean that with two litter boxes, you can try various types. Maybe cover one litter box and have the second as an open litter box. Or perhaps try a new top entry litter box or even a self-cleaning model. As long as the other box is a familiar model that the cat is already using regularly, experimenting with other types becomes much easier. The more litter boxes you offer, the cleaner they are, on average. Let’s say you can only get to cleaning the boxes once a day. With two boxes – assuming Kitty uses both – each box will have less waste in it by the end of the day. It also means that at least twice that day, your cat had a perfectly clean box to use. The other times, he had a cleaner box to use than he would have with just a single box. And yes, that does mean you could get away with scooping less often. This isn’t a license to get lazy with your litter box cleaning duties, mind. It just means that if you were to clean a single box twice a day, with two litter boxes, you can scoop once a day without affecting the overall level of cleaningness. You should know the answer by now – a minimum of three boxes. Yes, sometimes two cats manage with a single box. Not always though. Two boxes is better than one but if you want to make sure scooping once a day is enough, get three litter boxes for your two cats. The answer depends on your definition of “sharing a litter box”. If you envision two adult cats using the same single litter box at the very same time the answer is no. It’s highly unlikely for that to happen. You see, using the litter box requires space. A cat needs to walk inside, find a decent spot, turn around, dig in, check the hole, dig in some more, turn around again and finally get down to business. There is simply not enough room in a litter box – covered or not – for two adults cats to do that at the same time. So, yes, cats can share the same litter boxes among them. They just won’t use them at the same time. Which means that you as the owner shouldn’t worry about one cat using “the other cat’s litter box”. You just need to make sure that there are enough litter boxes to go around so that no cat has to “wait in line” to use a relatively clean litter box. We already said that two cats need three litter boxes. What about when you have three cats? Or five? Or fourteen? The formula still holds true. Ideally, the number of litter boxes that you should have is the number of cats + one. Is it realistic to have fifteen litter boxes in a single home? That’s a good question. And an even better question is does your home has enough space for fourteen cats? We all know it can be extremely difficult not to open your heart and home to a cat in need. However, every additional cat has needs. More food, more toys, more napping spots and overall space. And more litter boxes. Clearly, in many situations people have too many cats and resources become thinly stretched. That’s not a good situation for either human or felines. Rescuers will reply asking “will that additional cat #14 be better off on the streets?” and we don’t have a good answer to that and we don’t want to mention the H word. All we can do in this humble guide is alert cat owners to the fact that you should not overcrowd cats and you must provide them with enough litter boxes. And don’t forget that all of these litter boxes must be kept clean. Can you put two litter boxes next to one another? Now, should you place the two next to one another? That depends. As we said before, if you live in a large home, it may be a better idea to spread the boxes in more than one area. Again, think about the bathrooms that you have for humans. In your average large family home, there are usually two to three bathrooms, right? Having multiple bathrooms helps prevent those infamous “lines” next to the bathroom door in the morning. In theory, you could just build them next to one another in one area of your home. In fact, you could save some room by having one large bathroom with several stalls, like in a public toilets! But you don’t. Why? One of the reasons is that you want your toilets available in more areas of your home. When you get up at night in your second floor bedroom, you don’t want to have to walk down to the lower floor to use the bathroom, do you? You want one that’s as close as possible to your bedroom. Hence the concept of the bathroom as an attachment to the master bedroom. Back to cats – they would prefer the same thing. Most cats love spending the night in the same bedroom as their owner. Don’t make Kitty walk to the other side of the house, or to a different room, just to use the litter box. Since you have more than one litter box, have one that’s closer to your own bedroom. Does the type of box factor in? When we tell people about the formula for the number of litter boxes, they sometimes wonder whether the type of litter box matters. We mentioned that one reason for having extra litter boxes is that your cat will always have a clean(ish) litter box to use. Whether you use a covered litter box or an open one doesn’t really matter. As long as you clean the the litter boxes as frequently as you should. What about self-cleaning litter boxes? It’s only fair to ask whether self-cleaning litter boxes can affect the answer to the question of “how many litter boxes per cat you should have”. It does – but only to some extent. With two or more cats, you still have to deal with the issue of more than one cat needing to use the litter box at the very same time. Even with only one cat in your household, that cat may need to go just when the automated litter box is going through the self-cleaning procedure. Most healthy adult cats can “hold it” for the 5-10 minutes it takes the average self-cleaning box to go through a full cleaning cycle. However, a kitten, senior cat or one with health issues may not be able to. They could really benefit from having a second litter box. Taking all of that into account, even if you have a self-cleaning litter box, you should still offer at least one more litter box. Especially for a young kitten, an older cat or one with health issues. When you have more than one cat and more than one self-cleaning litter box, things may be a little bit different. Let’s say you have five cats. In this setup four self-cleaning litter boxes might be enough. 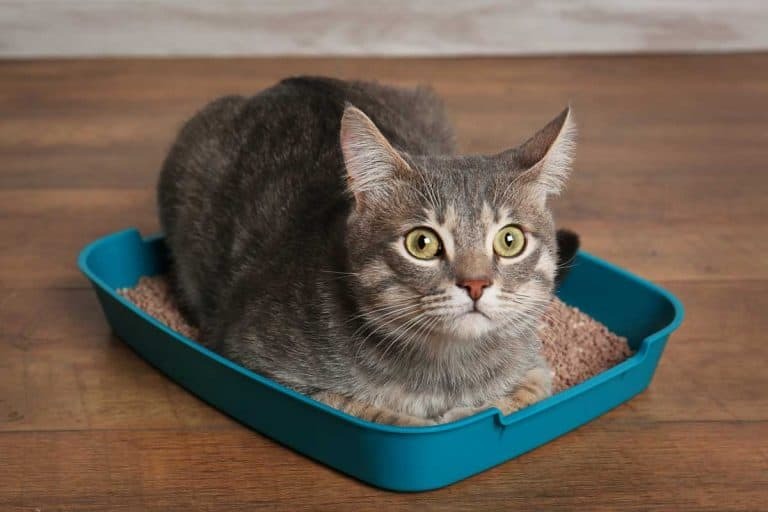 The likelihood of all five cats needing to use a litter box at the exact same moment is small, and with four very clean boxes, you should have all their needs covered (no pun intended). Can you have litter boxes of different types in the same household? What to do if your cat only uses one of the litter boxes? If you only have one cat and you clean the litter box well, it’s perfectly normal for a cat to use just the one litter box. Kitty may prefer the location or just develop a habit. Keep in mind that litter box preferences may change along the cat’s lifetime. Which means it’s usually a good idea to keep the second litter box on offer. After all, if it’s perfectly clean and unused, there’s no chores involved. Just keep it wherever you do as a backup litter box. If and when your cat decides she no longer wants to use the old litter box, she’s going to have an attractive alternative with the second box. 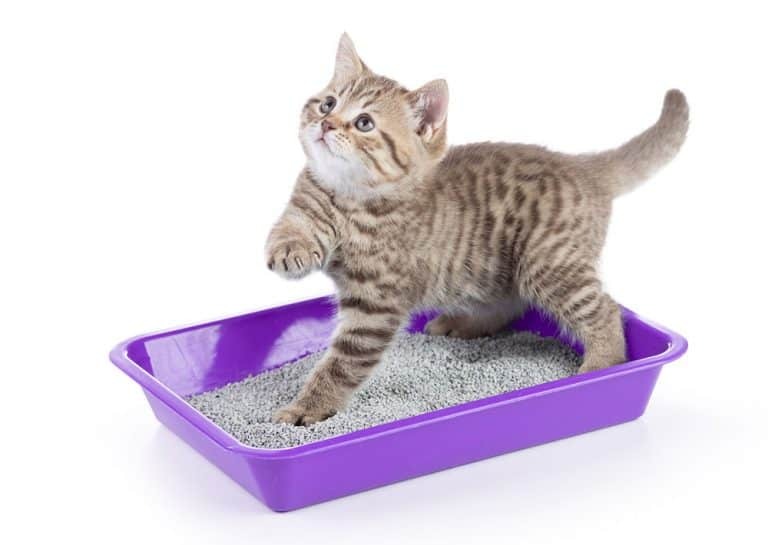 So, how many litter boxes per cat should you have? Stick to the classic formula if you can. The number of your cats + 1. Cat experts seem to agree on that magic number. Some people even report that adding just one more litter box cured their cat litter box avoidance. In a multiple-cat household, if you have a good self-cleaning box, consider losing one litter box from the total. However, with a senior cat, a young kitten or a sick one, or if you live in a very large house, consider adding at least one more box to the total. Don’t forget to clean all litter boxes regularly. 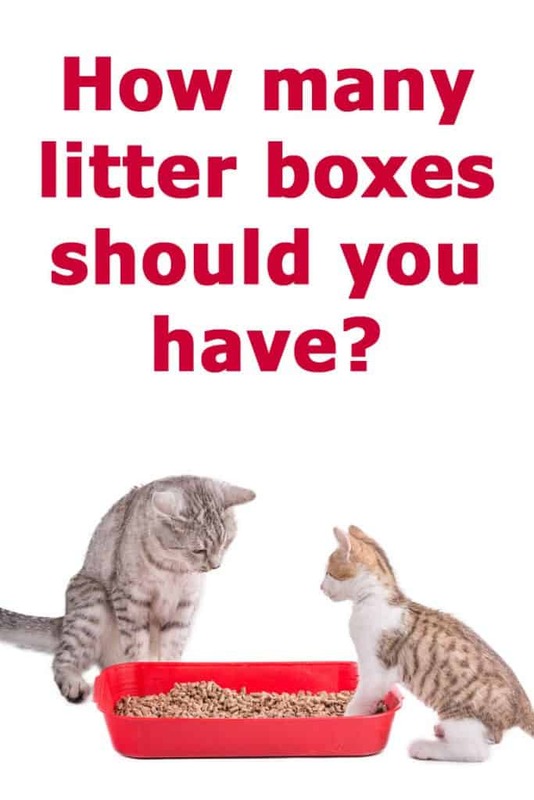 Read our guide about how often to clean the litter box and apply the guidelines to each one of the boxes you have. We hope we managed to answer your question of how many litter boxes you should have. Leave us a comment to let us know how many cats you own and how many litter boxes per cat you have. We’d love to hear your impressions on the topic!